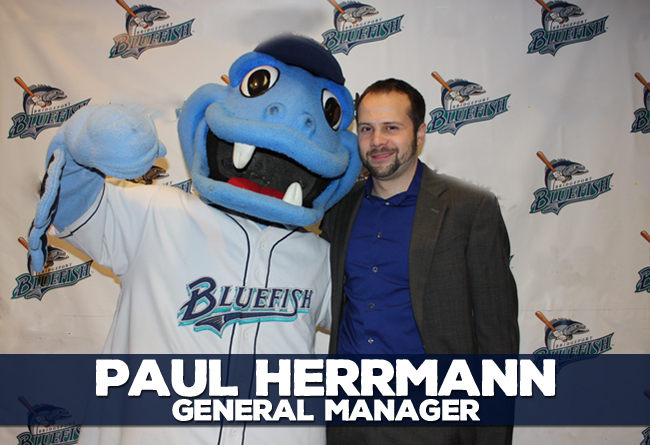 (Bridgeport, Conn., Jan. 12, 2017) – The Bridgeport Bluefish today announced that Paul Herrmann has been named the team’s new General Manager. Herrmann will be elevated from his previous role as Assistant General Manager & Director of Baseball Operations, and will replace Jamie Toole, who steps down to pursue new career opportunities. Herrmann, 31, is a native of Center Moriches, New York and currently resides in Milford, Connecticut. Paul joined the Bridgeport Bluefish front office in November of 2008, when he was hired as a Media Relations Coordinator. Prior to joining the Bluefish, Paul functioned as the Media Relations Assistant for the Long Island Ducks where he actively worked with local media, while also writing press releases and maintaining team statistics. Paul has also spent time working with the New York Jets, New York Knicks and Sussex Skyhawks. Herrmann graduated from Rutgers University in 2007 and spent two years in the Athletic Communications department during his time there.